Reading Eagle Company, a Reading, Pennsylvania-based, family-owned media company, has filed for bankruptcy protection. 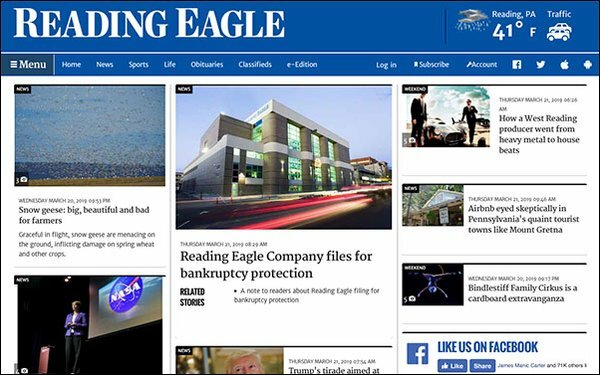 The company has published the daily Reading Eagle newspaper for over 150 years; it also owns WEEU 830 AM, the weekly South Schuylkill News, Pretzel City Productions and its commercial printing subsidiary REP.
Reading Eagle Company says it will continue to operate as usual, and publish and broadcast under bankruptcy rules while it finds a buyer. CFO Shawn P. Moliatu told a Reading Eagle reporter he is putting together a group of “community investors” and bank financing to bid on the company and keep it under local ownership. The company has 236 full-time employees and 20 part-time. In May 2018, the Eagle cut 16% of its newsroom staff; 11 people were let go, and two vacant positions were eliminated. The Eagle was founded by Jesse G. Hawley and William S. Ritter in 1868 and has been owned by the Hawley family ever since. Reading Eagle’s president and CEO Peter D. Barbey was also the owner of New York City’s iconic alt-weekly The Village Voice, which he bought in 2015, and then shuttered last fall. The Barbey family owns retail companies like Vans, The North Face, The Timberland Company and Lee jeans. The Reading Eagle Company has retained a media broker, Dirks, Van Essen, Murray & April, and has met with several potential buyers over the past few months. The Reading Eagle has an average daily circulation of over 37,000, and more than 50,000 on Sunday, according to the company. It says its website averages over 600,000 unique users and 3.2 million page views a month. Separately, Spirited Media announced a few weeks ago it would sell Philadelphia news site Billy Penn, as well as its Denverite and Pittsburgh site The Incline, and move into consulting. Both Denverite and The Incline have been sold.